MLS enjoyed another weekend full of goals and incident. DC United put five past Real Salt Lake without reply in a game in which RSL finished with nine players left on the pitch. 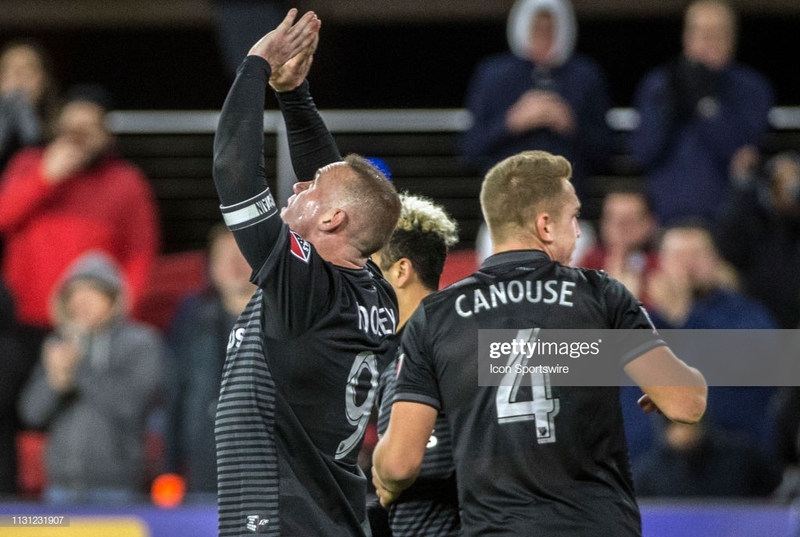 A Wayne Rooney hat-trick was followed by strikes from Lucas Rodríguez and Ulises Segura as D.C cruised to victory at Audi Field. Jefferson Savarino was sent off in first half stoppage time and Marcelo Silva also saw red midway through the second half in an afternoon to forget for RSL. The Seattle Sounders bagged four away at Chicago Fire in a 4-2 victory. Seattle went into the half two up courtesy of Víctor Rodríguez and Jordan Morris before adding two more in the second period through Nicolás Lodeiro and Raúl Ruidíaz. Raheem Edwards and Fabian Herbers netted two second half goals for Chicago in a game that the hosts could have fared better in should they have taken some of their many chances. The Fire will be hoping new signing Nico Gaitán can help improve this part of their game as he is integrated into the side over the coming weeks. The New York Red Bulls came from a goal down at home to San Jose courtesy of four second half goals. San Jose scored with their only shot on target through Espinoza in the fifth minute before an impressive second half fightback from the hosts. Memo Rodríguez opened the scoring and netted a second half winner in Houston Dynamo’s 3-2 success against a Vancouver side still yet to pick up a point in MLS this campaign. Montreal Impact also scored three in a 3-1 success away at Orlando City S.C.
Montreal scored two goals in two first half minutes to put themselves well on their way to victory and added a third late in the game before a stoppage time consolation courtesy of Dom Dwyer followed by a 96th minute red for Zakaria Diallo. Cincinnati recorded their first ever MLS victory with a resounding 3-0 victory over the Portland Timbers. Kendall Watson put the Blue and Orange in front early on before two goals in two second half minutes followed by a Larrys Mabiala red card for Portland sealed a comfortable victory and weekend to remember in front of a sold out 32,000 home crowd for FC Cincinnati. Meanwhile in Carson, California, the L.A Galaxy rested Zlatan Ibrahimović but still overcame Minnesota 3-2. Sebastian Lletget netted what proved to be the decisive goal in the 81st minute to put a stop to Minnesota’s attempted second half fightback. Atlanta United recorded their second draw in three matches with a 1-1 home tie against Philadelphia with Ezequiel Barco netting in the second half to redeem a point for the Five Stripes. Meanwhile NYCFC maintained their 100% draw record with a 2-2 home tie against LAFC. Carlos Vela scored both goals for the visitors including a late penalty to deny NYC what would have been their first victory of the campaign.